PURPOSE: To evaluate factors that influence retreatment results after primary hyperopic LASIK. METHODS: Restrospective study of 86 eyes of 61 patients that underwent LASIK to correct primary hyperopic spherical equivalent refraction and a second hyperopic retreatment due to undercorrection. All procedures were performed with the Technolas Keracor 217C excimer laser, lifting the preexisting flap for the retreatment. Preoperatively, under cycloplegia, mean spherical equivalent refraction of the series was +3.05±0.99 diopters (D). 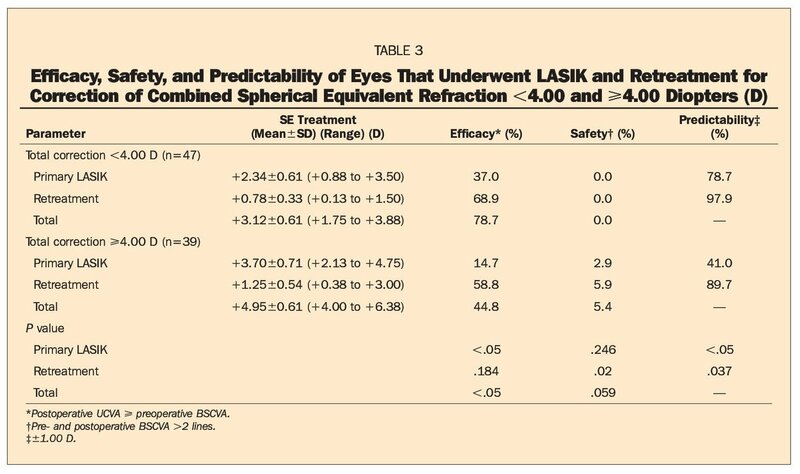 RESULTS: At last follow-up, mean spherical equivalent refraction was -0.07 ±0.50 D. Efficacy of the retreatment procedure was better when the primary LASIK attempted spherical equivalent refraction correction was <+3.00 D (P<.05). 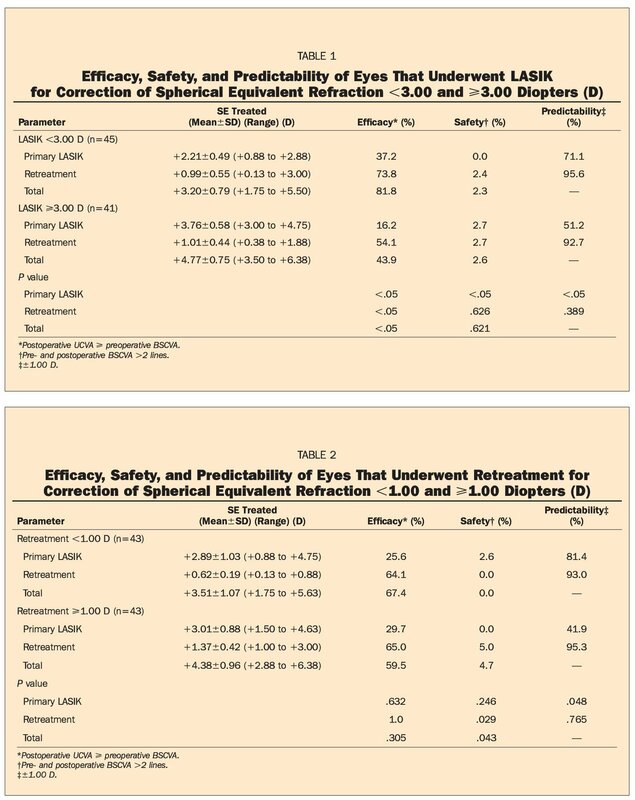 Safety of retreatment was lower when attempted spherical equivalent refraction correction was >+1.00 D (P<.05) and when attempted spherical equivalent refraction correction of both procedures combined was >+4.00D(P<.05). Some questions still remain regarding the efficacy of LASIK retreatment procedures after primary hyperopic LASIK: are the outcomes influenced by the amount of hyperopia treated at primary LASIK, or by the amount of hyperopia treated at the retreatment procedure, or by both (ie, total amount)? The records of 61 patients (86 eyes) who had primary hyperopic LASIK and LASIK retreatment for hyperopia (due to undercorrection) were retrospectively analyzed. In patients aged >40 years, the cycloplegic refraction was treated with 5% of undercorrection. Inclusion criteria were age s*23 years and stable refraction for >2 years. Exclusion criteria were topographic evidence of keratoconus, active ocular disease, pregnancy, and severe medical pathology. Different surgeons performed the primary LASIK procedures. Topical anesthesia (tetracaine) and the Moria LSK One microkeratome (Moria, Antony, France) were used in all patients. A nasally hinged corneal flap was created using an ?-suction ring, and 100- or 130-µp? depth plates. The Technolas Keracor 217C excimer laser (Bausch & Lomb, Rochester, NY) with PlanoScan V2.998, V2.9993, and V2.9997 software for hyperopia was used to perform the corneal ablation, and a 6.0-mm optical zone (with a peripheral transition zone of 9 mm) was programmed in all cases. Flap lifting and identical excimer laser equipment were used in all retreatment procedures, which were performed at a mean of 5 months after primary LASIK. Follow-up was 5=3 months after the retreatment procedure in 67 of 86 eyes (168. 71 ±124.23 days); the remaining 19 eyes were studied after 1-month follow-up. The following parameters were analyzed. * Efficacy of primary LASIK: percentage of eyes that showed an equal or better postoperative uncorrected visual acuity (UCVA) after the primary procedure compared to preoperative best spectacle-corrected visual acuity (BSCVA). * Efficacy of retreatment: percentage of eyes that showed equal or better UCVA after retreatment compared to pre-retreatment BSCVA. Figure 1. Spherical equivalent refractive outcome following retreatment. Figure 2. Defocus equivalent following retreatment. Figure 3. Visual acuity bar graph (BSCVA = best spectacle-corrected visual acuity, UCVA = uncorrected visual acuity). Figure 4. Change in best spectacle-corrected visual acuity following LASIK retreatment. * Total efficacy: percentage of eyes that showed equal or better UCVA compared to preoperative BSCVA. * Primary hyperopic LASIK safety: percentage of eyes that lost ^2 lines (Snellen) of BSCVA after the primary procedure compared to preoperative BSCVA. * Retreatment safety: percentage of eyes that lost 5*2 lines (Snellen) of BSCVA after retreatment compared to pre-retreatment BSCVA. * Total safety: percentage of eyes that lost 5=2 lines (Snellen) of BSCVA compared to preoperative BSCVA. * Primary hyperopic LASIK predictability: percentage of eyes within ±1.00 D of the intended correction after the primary procedure. * Retreatment predictability: percentage of eyes within ±1.00 D of the intended correction after retreatment. Last spherical equivalent refraction available before retreatment and at last follow-up (after retreatment) were used to calculate these parameters. Data were entered in a spreadsheet (Excel 97; Microsoft Corp, Redmond, Wash) and imported into statistical software (Epi Info, Centers for Disease Control and Prevention, Atlanta, Ga; and SPSS v6.13 outcomes analysis software, SPSS Ine, Chicago, 111). Pearson's chi-square test and Fischer's exact test were used to perform the bivariant analyses on qualitative variables. A P value <.05 was considered statistically significant. Sixty-one patients (86 eyes) received primary hyperopic LASIK and hyperopic retreatment (due to undercorrection). The mean age of the 36 women and 25 men was 41.3±10.54 years (range: 23.9 to 59.41 years) (18 eyes of 12 patients were aged 21 to 30 years, 23 eyes of 15 patients were aged 31 to 40 years, 24 eyes of 20 patients were aged 41 to 50 years, and 21 eyes of 14 patients were aged >50 years). Preoperatively, mean cycloplegic spherical equivalent refraction (sphere-cylinder/2) was +3.05 ±0.99 D (range: +0.88 to +5.63 D), mean cycloplegic spherical refraction was +3.84±1.01 D (range: +1.50 to +6.25 D), mean astigmatism was -1.59±1.19 D (range: 0.00 to -5.50 D), and mean keratometry was 42.73±1.28 D (range: 40.00 to 45.00 D). Mean UCVA was 0.36±0.23 (range: 0.05 to 1.00), and mean BSCVA was 0.89±0.14 (range: 0.30 to 1.20). Mean time between primary LASIK and the retreatment procedure was 166. 24± 118.58 days (range: 50 to 831 days). Before retreatment, the mean cycloplegic spherical equivalent refraction was +1.09±0.51 D (range: +0.13 to +3.00 D), mean cycloplegic spherical refraction was +1.59±0.60 D (range: +0.75 to +3.75 D), mean astigmatism was -1.00 ±0.55 D (range: 0.00 to -2.75 D), and mean keratometry was 44.58±1.57 D (range: 40.87 to 48.25 D). Mean UCVA was 0.73 ±0.19 (range: 0.20 to 1.00), and mean BSCVA was 0.90±0.13 (range: 0.50 to 1.20). Efficacy, safety, and predictability are shown in Tables 1-3. Table 1 compares patients with preoperative attempted spherical equivalent refraction correction <3.00 D to patients with preoperative attempted spherical equivalent refraction correction 3=3.00 D. Table 2 compares retreatment of < 1.00 D to 2=1.00 D. Table 3 compares combined spherical equivalent refraction correction <4.00 D to spherical equivalent refraction correction >4.00 D. As expected, the low hyperopia group (spherical equivalent refraction < 3. 00 D) obtained better results when compared to the high hyperopia group (spherical equivalent refraction 2=3.00 D) (P<.05). At final follow-up after the retreatment procedure, the mean cycloplegic spherical equivalent refraction was -0.07±0.50 D (range: -1.50 to +1.50 D), mean spherical refraction was +0.11 ±0.52 D (range: -1.25 to +1.75 D), mean astigmatism was -0.38±0.37 D (range: -1.50 to 0.00 D), and mean keratometry was 44.58±1.57 D (range: 40.87 to 48.25 D). Mean UCVA was 0.85±0.15 (range: 0.25 to 1.00), and mean BSCVA was 0.90±0.13 (range: 0.35 to 1.00) (Figs 1 and 2). In three eyes (two patients), a significant punctate keratitis was found; one eye lost 2=2 lines of BSCVA. Peripheral interface epithelization was found in three eyes (three patients) (Figs 3 and 4). This is the largest study to report the results of primary hyperopic LASIK and hyperopic LASIK retreatment (due to undercorrection). Other authors have reported hyperopic LASIK retreatment results, but the primary procedure was myopic LASIK.1'3'4 Hersh et al2 previously reported 291 LASIK retreatments, but only 1 eye was hyperopic preoperatively. Mulhern et al5 presented a series of 17 retreatments after hyperopic LASIK. However, the series is not comparable to ours, because it includes 7 retreatments due to decentration and 2 due to interface epithelization, conditions that were not present in our cases. Moreover, the series included retreatments due to overcorrection. Patients aged 3=40 years who undergo myopic LASIK are at increased risk of requiring retreatment.2 Hyperopic patients are expected to experience the same, but mainly due to the fact that young patients can easily compensate for hyperopic residual defects because of the accommodation that these patients present. Retreatment procedure predictability and total safety decreased with increasing retreatment spherical equivalent (3=1.00 D compared to <1.00 D). 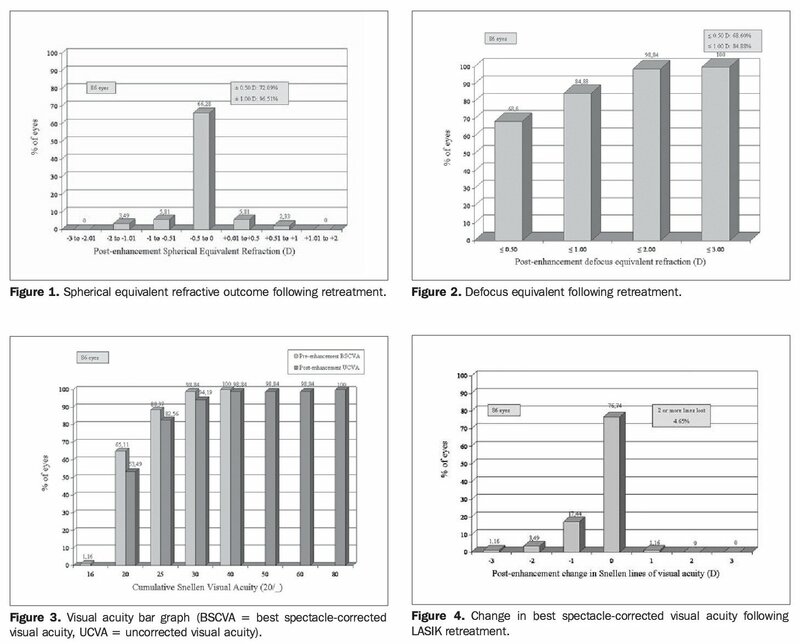 Total efficacy, safety, and predictability decreased with increasing hyperopia (ie, the amount of hyperopia treated at the primary hyperopic LASIK and at the retreatment procedure). This is a retrospective study, therefore, some of the data could have been different if additional follow-up had been done. 1. Rojas MC, Haw WW, Manche EE. Laser in situ keratomileusis enhancement for consecutive hyperopia after myopic overcorrection. J Cataract Refract Surg. 2002;28:37-43. 2. Hersh PS, Fry KL, Bishop DS. Incidence and associations of retreatment after LASDC. Ophthalmology. 2003;110:748-754. 3. Lyle WA, Jin GJ. Laser in situ keratomileusis for consecutive hyperopia after myopic LASIK and radial keratotomy. J Cataract Refract Surg. 2003;29:879-888. 4. Jacobs JM, Sanderson MC, Spivack LD, Wright JR, Roberts AD, Taravella, MJ. Hyperopic laser in situ keratomileusis to treat overcorrected myopic LASIK. J Cataract Refract Surg. 2001;27:389-395. 5. Mulhern MG, Condon PI, O'Keefe M. Myopic and hyperopic laser in situ keratomileusis retreatments: indications, techniques, limitations, and results. J Cataract Refract Surg. 2001;27:12781287. 6. Cobo-Soriano R, Llovet F, Gonzalez-Lopez F, Domingo B, Gomez-Sanz F, Baviera J. Factors that influence outcomes of hyperopic laser in situ keratomileusis. J Cataract Refract Surg. 2002;28:1530-1538. 7. Peters NT, Iskander NG, Gimbel HV. Minimizing the risk of recutting with a Hansatome over an existing Automated Corneal Shaper flap for hyperopic laser in situ keratomileusis enhancement. J Cataract Refract Surg. 2001;27:1328-1332. 8. Davis EA, Hardten DR, Lindstrom M, Samuelson TW, Lindstrom RL. LASDC enhancements: a comparison of lifting to recutting the flap. Ophthalmology. 2002;109:2308-2314. 9. Rubinfeld RS, Hardten DR, Donnenfeld ED, Stein RM, Koch DD, Speaker MG, Frucht-Perry J, Kameen AJ, Negvesky GJ. To lift or recut: changing trends in LASDC enhancement. J Cataract Refract Surg. 2003;29:2306-2317.